Well, I didn’t do myself any favors with my poor tracking of soil pH before planting the blueberries. Between the clay soils and overestimation of the buffering effect of decaying organic matter placed into raised beds, my soils were slightly alkaline at the time of planting in the spring. With fall approaching, it was time to apply sulfur while the soil microbes are still active. Sulfur is not biologically active as its approval for organic uses may insinuate, but it is literally just an element from the periodic table. It is mined and shipped out in its pure form (if you are lucky enough to find pure sulfur) or in my case, cut with 10% inert fillers. Now it is time to calculate the application rates which I have discussed before. Below are the tables from that discussion. Ohio State University Extension is the source of the Table 1 while Table 2 is the same but with my calculations converting the application rates from pounds of sulfur per acre to pounds of sulfur per 1000 square feet. Table 1. Rates of elemental sulfur required to decrease soil pH to a depth of 6 inches. 1 Assumptions—cation exchange capacity of the sandy loam, silt loam, and clay soil are 5, 10, and 20 meq/100 g, respectively; soils are not calcareous. Table 2. Rates of elemental sulfur required to decrease soil pH to a depth of 6 inches. Buy agricultural sulfur. It was $22/50 pounds at my local feed store. The last picture shows the sulfur on top of the mulch, spread lightly around plants and their active roots while applied more heavily in the spaces between plants, which is only done by necessity. 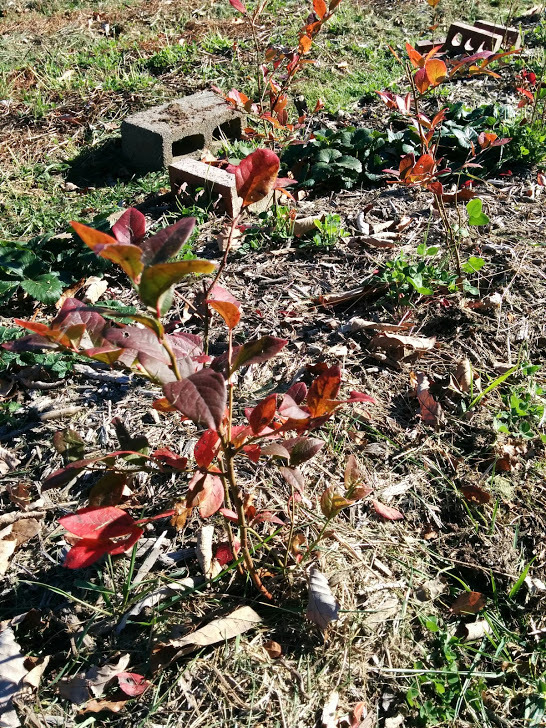 In the unplanted blueberry bed the sulfur was applied evenly to bare soil then covered by mulch. From this point on, test the soil every year or every other year. Repeat the above process as needed! If I had to make the choice of a single fruit to eat for the rest of my life, it would be blueberries. Raspberries are such a close second that I would read the fine print of the agreement to try and loophole them in. Blueberries need acidic soil. I will have to retest my farm, but I anticipate the karst limestone-heavy area is going to need some amendment. In the raised beds I need a solution that doesn’t involve hauling in chemicals or soil amendments. My solution will be to mulch up many of the cedars that have encroached on the pasture. Every year, I will assist by adding a top mulch of chipped, discarded christmas trees (needles and all). I would like to note that I have not found any studies that convince me that pine mulch is any better the just plain old organic matter in acidifying the soil. In a pinch, I won’t hesitate to use the leave litter from the forest as a soil amendment. As for companions, the literature prescribes clover to help fix nitrogen or acid-tolerant herbs for pest deterrence. I’m going to take a different approach here. My perennial blueberry patch will be a sanctuary for the bees. Widely-spaced Rhododendron could provide shade for the plants during the dog days of summer, beautiful flowers in its long blooming season, and potentially psychedelic honey. I’ll probably avoid them in the end, but they are a viable companion. Lewisias flowers enjoy acidic soils and bloom in the late winter providing food for the bees when not much else is available. Strawberries are another delicious potential companion that would provide a living mulch but they have many pest and disease issues. Yarrow flowers have a rich history of natural medicinal use and seem to enrich soil where they grow. Clover is the last plant to consider as a legume that fixes nitrogen for the berries high demand. Honestly at this point I have no idea what companions I want to plant with the blueberries. I think for now I will plant strawberries as a ground cover with no expectations regarding production while locating the flowering herbs on the boundaries of the rows. If anyone has any suggestions for acid-tolerant plants that provide human food or nectar for bees, please let me know!